California DOJ To Join The Investigation Into Stephon Clark Shooting : The Two-Way The attorney general announced a separate inquiry to review of policies, procedures and practices at the Sacramento Police Department to identify ways to achieve safer outcomes. 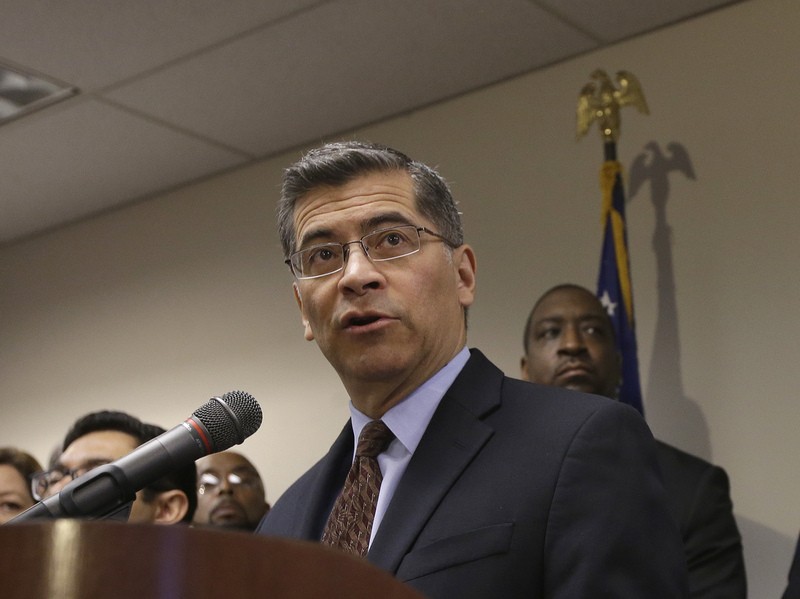 California Attorney General Xavier Becerra, announces his department's involvement in an investigation into the killing of Stephon Clark by two Sacramento Police officers. Attorney General Xavier Becerra announced at a press conference Tuesday that his department's inquiry will also include a review of law enforcement policies, procedures and practices at the Sacramento Police Department to identify ways to achieve safer outcomes. "Although we will continue to coordinate with the Sacramento Police Department, we will retain our independence as we conduct this review," he said, adding that its findings "will be based on the facts and the law; nothing more, nothing less." Becerra also noted he has independent authority to consider prosecution of the two officers involved in the killing, something Clark's family is urging officials to pursue. Sacramento Police Chief Daniel Hahn said the attorney general's office is joining the investigation at his request, considering "the extremely high emotions, anger and hurt in [Sacramento]." "Our city is at a critical point right now and I believe this will help build faith and confidence in the investigation from our community," he said during the press conference. Hahn said the police department will fully cooperate with Becerra and it planned to continue openly sharing information with the public as quickly as possible. "We released body-cam and helicopter footage within three days," he reminded residents and activists who have in recent days taken to the streets in protest. "Because that was the right thing to do for our community." Clark was killed by officers responding to a call about a person allegedly breaking car windows in the neighborhood where the 22-year-old's grandmother lives. Police spotted Clark and gave chase. Body-camera video footage captured the brief pursuit, during which the officers were heard yelling that Clark had a gun. At no point in the footage are they heard identifying themselves as police officers but the sounds of 20 rounds striking Clark can be heard. The object in Clark's hand turned out to be not a gun but a cellphone. Sacramento County District Attorney Anne Marie Schubert, whose office is conducting its own investigation into what she called "a tragedy," cautioned residents to be patient. "Understand that this process will take time," she said. "Thorough and fair independent review demands that we do it right." Mayor Darrell Steinberg and local religious leaders also called for peace and calm in the weeks ahead. "I recognize that we have difficult days ahead as we grieve and confront the death of Stephon Clark," Steinberg said, imploring the public not to resort to violence. "Violence must not beget violence. The country is watching us. Let us show how a city in pain, together with all of our partners, can in fact achieved a better way," he said. The Sacramento City Council is holding a meeting Tuesday evening to allow residents an opportunity to discuss Clark's shooting with a panel of city leaders.